Last summer at Alan November's Building Learning Communities conference I gave my Whiplash! workshop. One of the ideas I threw out (the link is to the podcast, download and listen from 12 min 50 sec through 15 min 32 sec) that made some people's heads snap was one Clarence and I were talking about in Starbucks last Friday. So Clarence followed up with Courses Need To Die and Bud comments: "...get to work on it ... Maybe there's a grant somewhere aching to be written." That's the sort of stuff I'm no good at but this idea fires my imagination. Let's say a LARGE group of teachers from all over the world gets some grant money to build a global collaborative educational project. Let's say someone like David Warlick helps us build an aggregation engine like hitchhikr for courses (he gets paid using some of the grant money). It would include a tagging functionality for the subject, specific content, age level of the students, date and GMT time. (What other tags would be important?) Let's say every classroom in the project gets at a minimum high speed internet, speakers, mic and skype. (How about video?) And let's say the students in the project do Flat Classroom-like projects where they produce learning objects, aggregated on a blog, that develop their "expert voices". Expert Voices: (The idea behind "developing expert voices" comes out of the talk I had planned to give at the PLE Symposium last Friday.) This is something I'm going to be doing with my classes next semester instead of the Go For Gold assignment. Let's say we can do this thing. How do we begin? To start I think we need to get the idea out there and see if we can build a critical mass. I'm tagging this post with the names of several blogging teachers. If you got tagged, but especially if you didn't, and want to help move this idea forward or participate in any way, blog it. Add a bunch of other folks in your list of tags and include the tag: expertvoices. I bounced this idea off my principal, just to see how he'd react. He said getting the grant money should be no problem. It will depend upon getting that critical mass of global educators on board; k-20 (kids aged 5 to 25+). So, what d'ya say? Do you want to have your students participate in the global knowledge commons? I was going to shout out to a bunch of teachers who blog with their students and at the last minute decided to "leave it up to the network." ;-) If the idea has merit then please post about it on your blog and let's try to build a critical mass of involved educators. If it doesn't then this post will be quietly ignored. If you teach math please leave me a comment if you'd like to get together to have our kids collaborate in this way -- similar to what Julie and Vicki did with their Flat Classrooms Project. In some ways it was like a small scale Manitoba edublogger meet up. I finally shook hands with Clarence Fisher and George Seimens. John Evans was there too. John and I have been trying to share a cup of coffee for a while now; it was good to chat and catch up with each other a bit. I also had the pleasure of meeting Karen Phillips and Joan Badger who teach at an elementary school here in Winnipeg. Clarence, George and I had been planning for this event for a few months. Clarence and I got to spend some quality time at Starbucks between the end of the symposium and joining George, Peter Tittenberger and Terry Anderson for dinner. The staff at the University of Manitoba Learning Technologies Centre were warm, welcoming and gracious. Everything went beautifully until about 20 minutes before we started our presentation. While there was an internet connection for the live webcast there was none for us as presenters. This didn't really impact George or Clarence, whose presentations didn't require internet access. All my materials were housed on a wiki and I had planned to showcase some of my online teaching strategies using examples of student work and some video content. (2) Listen to the audio (20.3 Mb, 42 minutes 14seconds) and click through the links in the presentation below. I've copied the original from my page of the wiki we had used to collaborate. 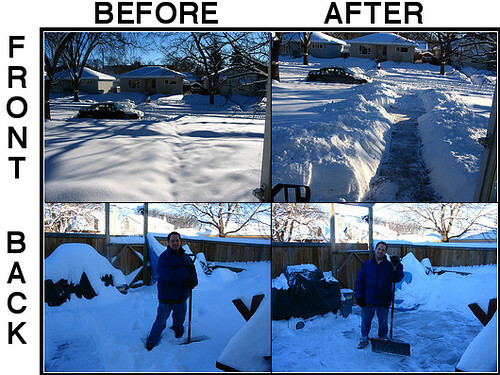 My Professional Blog: A Difference. What can I do now that I couldn't do before? Learn about Scribe Posts then visit The Scribe Post Hall Of Fame. • New technologies give rise to new pedagogies ... pictures worth more than 1000 words. • Give students the tools ... then watch what they do. Have you read Thomas Kuhn? A Message from Karl Fisch. If you're interested in other people's reflections I've come across two blog posts summarizing the symposium. One by Carol Thomas and another by The Illuminated Dragon. (4) A number of years ago I decided I wanted to learn a wind instrument. I've toyed with learning harp (harmonica) a la Bob Dylan. I bought two harps to start, a C harp and a G harp, but never really followed up on it. 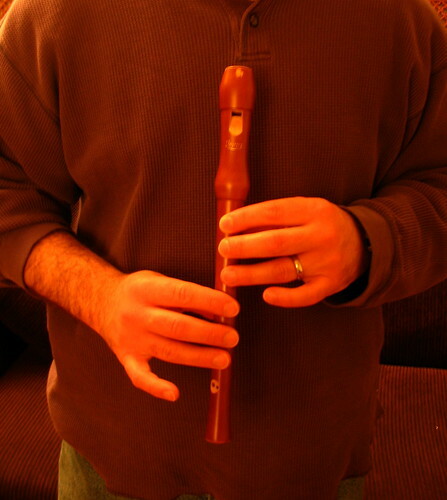 Then I decided to pick up the recorder so I bought this nice wooden soprano recorder. A couple of times each year I torture my family as I try to teach myself how to play using two excellent methods books I bought with the recorder. I've almost worked my way through the first one. (5) I'm not from Winnipeg, my wife is. 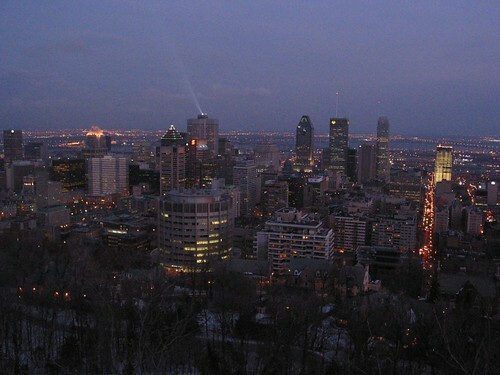 I was born and raised in Montréal. I miss the city. It's beautiful; night and day. An interesting opportunity came my way this past summer. I received an email from Peter Tittenberger (Acting Director of the Learning Technologies Centre at the University of Manitoba) asking if I would be interested in participating in a symposium he was planning on personal learning environments on January 26, 2007. To make a long story short I said yes and so Clarence Fisher, George Seimens and I are giving the afternoon plenary session at the symposium this Friday. The keynote address that kicks off the day is being given by Dr. Terry Anderson (from Athabasca University). Full details of the event are online here. Over the recent holiday season I watched many of the archived recordings of past TED conferences. 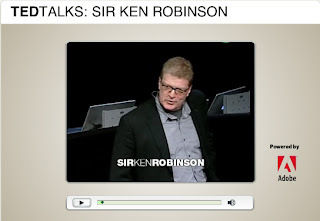 Last July I mentioned Sir Ken Robinson's presentation on the value of creativity in education. I've listened to that presentation several times now. I get more out of it every time I hear it. Last Tuesday I shared it with all the teachers in my department at our monthly professional development meeting. We've been developing projects at the grade 10 and grade 11 levels for our Consumer Math courses similar to the projects students have to do in the grade 12 provincial standards test. The provincial assessment uses a rubric for grading that is very dense and difficult for students to understand. The teacher who tested the grade 11 project we developed shared back with us that she felt the rubric needed a little work to be a more effective guide for the students work. This lead to me sharing how I approach rubric design and how I've tried to incorporate creativity into the rubrics I use to assess students project work. Some of these comments aren't new to me. They've been discussed in depth in the edublogosphere in the past couple of years. Some of the teachers in my department may have been hearing these ideas for the first time ... I can see how that might be intimidating. [Young] kids will take a chance. If they don't know they'll have a go. They're not afraid to be wrong. I think this is true. Little kids love to learn new things. Especially if they have big words attached to them. They like to look smart. What happens to them as they get older? Why is it that "looking smart" in a high school classroom isn't "cool?" -- then again, it is becoming cool to be a nerd. I recently saw this written on a young lady's t-shirt: Talk Nerdy To Me. If you're not prepared to be wrong then you will never come up with anything original. » The creative person must possess as many "bits" of information as possible, falling into as wide a variety of types as possible; i.e. he must be broadly educated. » The creative person must be able to combine "bits" with facility and recognize the combinations he has formed; i.e. he must be intelligent. » The creative person must be able to see, with as little delay as possible, the consequences of the new combinations of "bits" which he has formed; i.e. he must be intuitive. » The creative person must possess courage (and to the general public may, in consequence, seem a crackpot). » A creative person must be lucky. We stigmatize mistakes. We're now running national education systems where mistakes are the worst thing you can make. I think there's some truth to this. The thing is, making mistakes is an important part of learning. No one has a clue what the world will look like in five years and yet we're educating [kids] for it. We are educating people out of their creative capacities. We don't grow into creativity we grow out of it, or rather, we get educated out of it. As children grow up we start to educate them from the waist up. And then we focus on their heads; and slightly to one side. Hmmm ... we've come a long way from ancient Greece where the curriculum consisted of mathematics, philosophy and gymnastics. This also bangs up against the ideas in Dan Pink's recent book A Whole New Mind. The whole purpose of public education, throughout the world, is to produce university professors. How many successful people do you know with a PhD? Later, Sir Ken says that intelligence is diverse. Isaac said creative people should be broadly educated. Personally, I want my kids to get a good eduction in phys. ed., music, drama and the traditional academic subjects. Knowing something about music and philosophy has made me a better math teacher. [Our education system] came into being to meet the needs of industrialism. Intelligence is made up of three things, it's diverse ... dynamic ... and distinct. Creativity: The process of having original ideas that have value; comes about by the interaction of different disciplinary ways of seeing things. <When talking about dancers and the prevalence of ADHD today> [Some people] have to move to think. There are four fundamental learning styles, VARK: Visual, Auditory, Read/Write and Kinesthetic. By far, that last one is the hardest for me to work into the teaching of mathematics. The comment about ADHD struck a chord with me. Is it so prevalent and severe today that it merits the presecription of ritalin in so many kids? 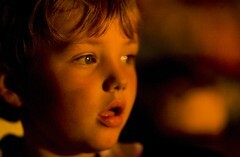 Or is it really about the need of some adults to have kids be quiet; seen but not heard? Can you imagine Robin Williams being as successful today as he is if someone had prescribed ritalin for him when he was a child? It's interesting to me that many of the rambunctious (undesirable?) behaviours seen in some kids, when manifested in adults, are considered positive traits. Our education system has mined our minds in the way that we have strip mined the earth for a particular commodity, and for the future, it won't service. I spent the better part of December blogging about the flickr assignment I developed and the process and product of the rubric that we generated. It seems to have struck a chord with some folks as I continue to get email from people asking about the both the process and product. Once again, accessing my "outboard brain" (this blog -- kudos again to Brian for that metaphor) I've compiled all the posts about the project here in the order that they were published. See the end for an update on how the assignment has evolved since I last wrote about it. Description and structure of the assignment and assessment. Some hurdles that were overcome. I was displeased with some of the results. I decided to develop a rubric to guide the students work and recognize various levels of achievement. A Google Doc is used collaboratively with all my students. 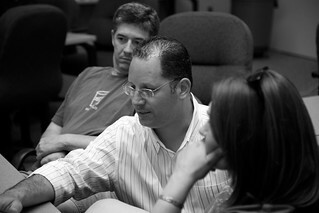 Lani (blog mentor) and I add comments throughout the process to help focus their thinking. Some folks request to observe the process. An update on the revisions students made to the document. Open invitation to other interested teachers to observe the process. 11th hour snapshot of the rubric revisions in progress. Fascinating, non-linear view of the thinking that students put into developing the document. 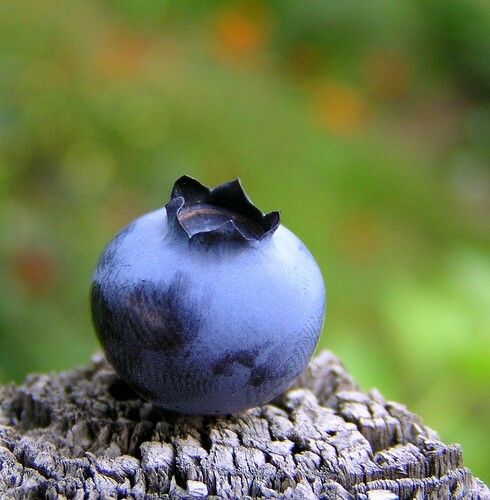 »Flickr Assignment Rubric v1.0 - We're Out of Beta! Final version of the document. 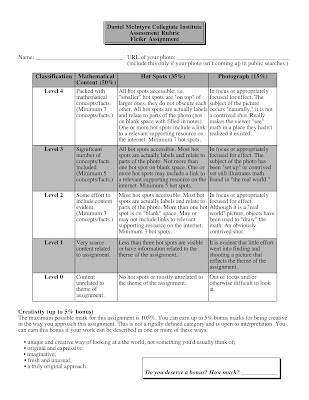 This rubric was published to all the class blogs. I also gave each student a hard copy of the rubric. This hard copy doesn't have the links to examples that the online version does. It is also missing some descriptive text that is included in the online version. Having the students assess their work and hand it in, I feel, made them more accountable for their grades. Some of them didn't do the assignment. They handed in a page today, with their name on it, that had only the words Level 0 circled. Next semester I plan to do this assignment again. I will reopen the rubric to the new students for editing. They will benefit by at least having a more concrete set of guidelines to begin with. I just can't get enough of the TED conference: exploring the intersection of great ideas from diverse disciplines. That's where all the greatest future innovations will come from. Watch this. Google Earth is passé when you can access NASA's databases and manipulate them visually just by dragging your fingertips across an "interface-free," touch-driven computer screen. Best line: "With initiatives like the $100 laptop ... I kind of cringe at the idea that we're going to introduce a whole new generation of people to computing with this standard mouse and pointer interface."